What Influence on Content Marketing Evolution? How has marketing evolved over time? It’s safe to say that content marketing strategies have reached a crossroads and new trends and techniques have taken the place of previous ones. Today, a lot of customers show interest in a website that posts user-friendly content and engages them in unique ways. Writing simple articles and getting them published in bulk is not going to be accepted. In fact, the digital marketing landscape has become increasingly fragmented and new, creative-minded people have joined the race. We are in an era where articles or content mean nothing if they are not marketed well or are not enough engaging and influencing. There is a lot of difference between traditional ways of doing business and content marketing. Until or unless you do not have an online presence and have not promoted your content well, you can never be assured of success and may not be able to generate revenues. What are the content marketing trends 2018? These days, a lot of strategies have been implemented to market content well. Some of the best ways are mentioned below. According to edujungles.com, users love to watch your business-related videos. That’s why you should make as many videos as possible. A picture is worthwhile, but it cannot be an alternative to videos. So placing so many pictures in your articles would not benefit as much as videos. Experts reveal that it is one of the finest content marketing trends. Videos save the time of users and allow them to know more about your business in a matter of minutes. They may not like to read a lengthy article but would love to watch videos relevant to your company or products. It is one of the best and finest content trends. Without a strong social media presence, you may never be able to generate traffic to your blog or website and cannot achieve the desired results. Thus, besides creating videos and marketing them, you should pay attention to your Twitter and Facebook presence. Ideally, you can make a Facebook page or communicate with potential customers through Twitter. Another way is to upload business-related photos on Instagram and increase the number of followers on a daily basis. It has become a global phenomenon, so you would have to understand how big and impactful live streaming is. Every social media website such as Facebook provides its users with this facility. 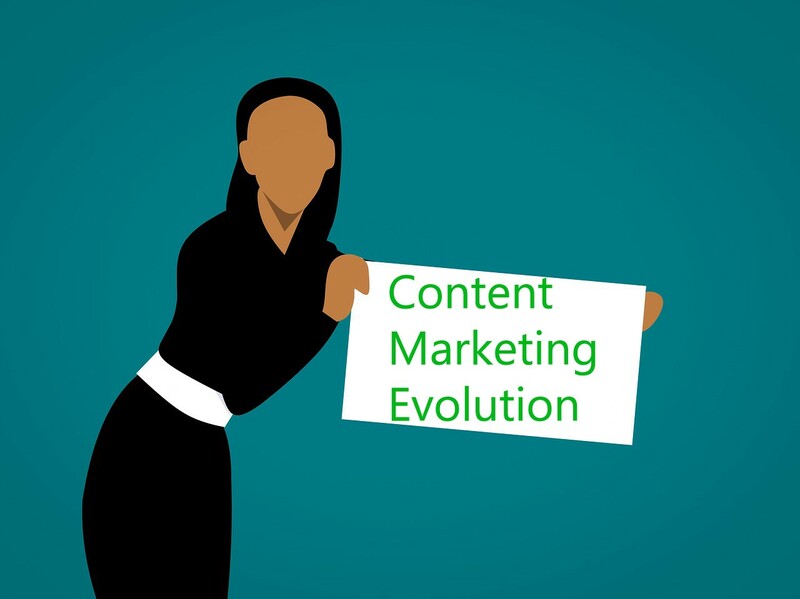 You can engage a large number of people and drive traffic to your website if you opt for this content marketing or evolution marketing strategy. There is no need to hire specialists in this regard; if you have an iPhone and a strong Facebook presence, then live streaming will guarantee you lots of sales. Search engine optimization or SEO is often overlooked. A lot of people think that placing many keywords in the same article would benefit them, but it is not so. They would have to understand that inserting so many keywords in the same article may damage its flow and compromise on quality. You should not write generic content and place so many long-tail or short-tail keywords in it. Search engine optimization also does not mean to write a lot of guest posts or building numerous backlinks without taking care of quality. Experts have proved that customers and users are the best marketers of a brand. In fact, more than 60 percent of consumers love placing user-generated content above normal or ordinary articles. These include blog posts, reviews, comments, and ratings, etc. With these techniques, they can be assured of success in a long-run and are able to drive lots of traffic to their blogs instantly. You can attract a lot of users to create articles for you and display your content on their social media profiles. Experts from Custom essay writing believe that the next few years are very important for content marketers as new strategies and techniques are being introduced. As a marketer, you should be aware of the power and significance of quality content. It is your only way to survive in this competitive world, but the wrong use or placement of articles can ruin your business. Experts indicate that search engine optimization especially guest posting may not be of help in the next few years as the users will pay more attention to audio-video content than these ordinarily written articles. In the meantime, the excessive and unwise use of keywords would come to an end. Google’s Penguin keeps updating its algorithm almost every day. For new companies or websites, it is too complicated to cope up with all challenges and to take care of content quality. We should bear in mind that the content marketing trends will keep changing, so the best way to survive is to align our content with international standards and to come up with the expectations of users. How to Use Audience Insights on Facebook? Hi, thanks for sharing your experience and Tips regarding factor affecting the evolution of content marketing. Content marketing is completely changed now content should provide value to readers, SEO friendly, marketed effectively. Excellent post as usual. You have given very good suggestions. I strongly believe social media presence is very important in today’s market. It is important to be visible through various social media channels in order to get more viewers.